Molecular Geometry discusses topics relevant to the arrangement of atoms. 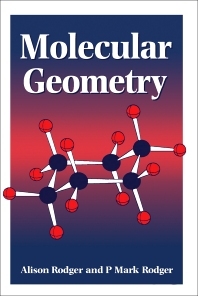 The book is comprised of seven chapters that tackle several areas of molecular geometry. Chapter 1 reviews the definition and determination of molecular geometry, while Chapter 2 discusses the unified view of stereochemistry and stereochemical changes. Chapter 3 covers the geometry of molecules of second row atoms, and Chapter 4 deals with the main group elements beyond the second row. The book also talks about the complexes of transition metals and f-block elements, and then covers the organometallic compounds and transition metal clusters. The last chapter tackles the consequences of small, local variations in geometry. The text will be of great use to chemists who primarily deal with the properties of molecules and atoms.